(CNN) -- With an unbroken chain of blockbuster hits under their belt -- including "Toy Story," "Finding Nemo," "The Incredibles," "Cars" and many others -- the talented team of men and women who work for Pixar seem to have the Midas touch. 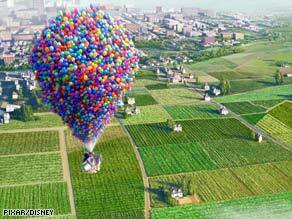 An elderly balloon salesman uproots his house with the help of thousands of balloons in "Up." Their latest endeavor, "Up," follows the life of Carl Fredricksen, a balloon salesman who has recently lost the love of his life, Ellie. Now in his golden years, Carl decides it's finally time to make Ellie's lifelong wish come true -- to visit Paradise Falls in South America. He quickly becomes aware he has a stowaway: Russell, a young Wilderness Explorer who's trying to earn one more merit badge. CNN traveled to Emeryville, California -- the site of the famous Pixar campus -- and sat down with actor Ed Asner, who lends his voice to Carl; technical director Steve May; and co-director Pete Docter to get behind The Scene. Ed Asner: Well, the first 10-15 minutes, that's a grabber. Nobody can resist it. Steve May: Even though we have a cartoony world, you are trying to make the audience believe that the world and the characters exist. The biggest challenges were a flying house that flies underneath a big canopy of balloons. So, if we can kind of capture that on the computer and animate our balloons to look believable too, then the audience will believe that the house can fly. Pete Docter: There is an amazing group of computer scientists that really approach these things both as an artist but also as a scientist. May: You have thousands of balloons that all interact with each other, and all the balloons have strings, so this is a very complex animation problem. Docter: They think about the physics of the balloons. They bump into each other, they can turn wind up or down so they can dynamically move, and then you get the strings that attach those balloons to the house. It's a fairly complex mathematical problem. We tried to make things more like a window you look into, opposed to things coming out at you. May: And then when Russell is on the front porch of the house and you look down and see how far down it is, the audience is scared. Docter: This one I really feel close to, and weirdly, even though it's a film about a 70-year-old man who floats his house away, I feel it's a really personal film.